I get to cross off another recipe off of my Foodie bucket list. 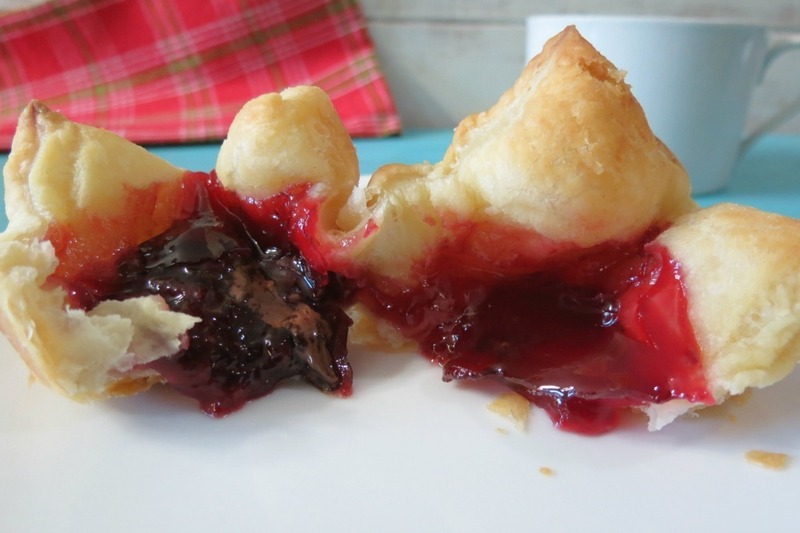 I actually made the most awesome recipe using Pepperidge Farm® Puff Pastry Sheets. I am just so proud of myself. I have to show you first what I made. How cute are these? These are my Chocolate Cherry Tartlets. They are fluffy, light, chocolaty and sweet. Oh my gosh, they are amazing!!! 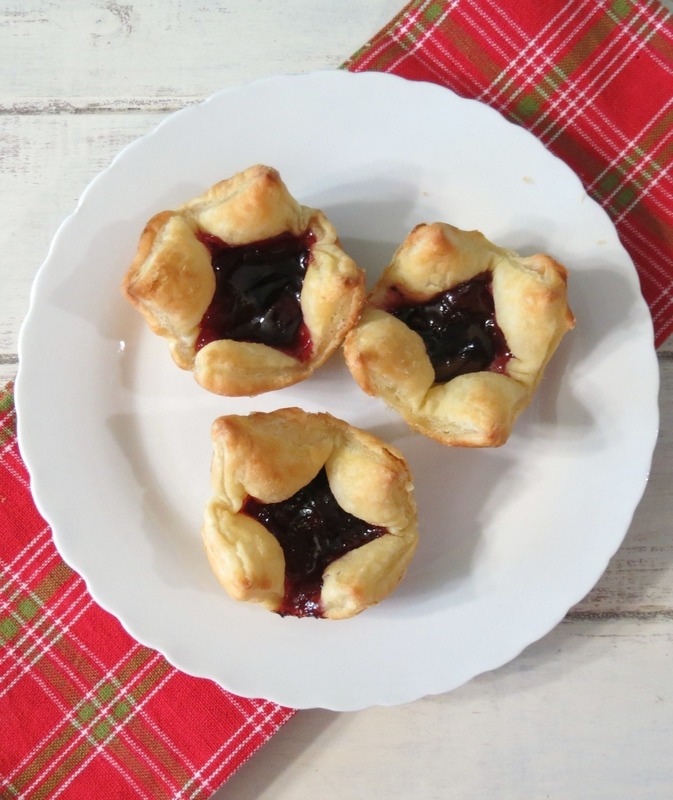 These little pastries are just perfect and have the right amount of filling. The best part is they are super easy to make. I was pretty intimidated using Pepperidge Farm® Puff Pastry Sheets because I am not very good with pastry making of any kind. But I followed Pepperidge Farms tutorial on how to use Puff Pastry and what a cinch it was to make. Don’t let Puff Pastry intimidate you, you can check out Pepperidge Farms website to see the simple instructions to make just about any shape Puff Pastry you like. I actually broke down the steps on how to make the tartlets for you. Step 1. Make sure Puff Pastry is thawed out, I left mine in the refrigerator over night and you use a cold surface like a marble cutting board. Step 2. Lightly dust work surface with flour. Step 3. Roll out Puff Pastry. I found lightly flouring the Puff Pastry made it easy to use a rolling-pin. Step 4. Cut Puff Pastry into 9 squares. I used a pizza knife for cutting. Step 5. 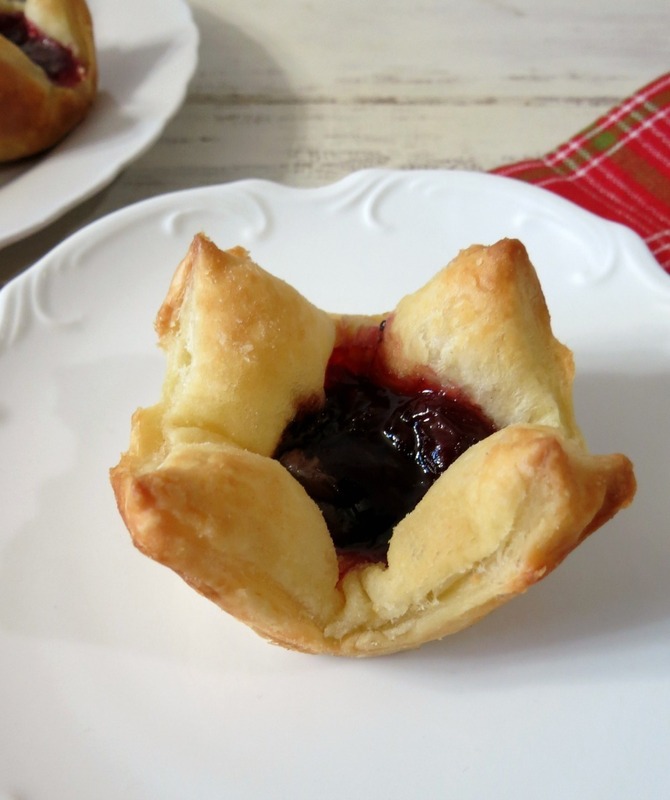 Place Puff Pastry into a standard size muffin tin and lightly press down. Step 6. Place 2 dark chocolate wafers into the center of the tartlets. Step 7. Place 1 teaspoon of cherry jam over the chocolate. Step 8. Bake for 10 minutes at a 400 degree oven. Step 9. Let cool for 10 minutes; with a butter knife carefully run the knife around the tartlets. I know I said this but I am really, really, really proud of these. My Husband just loved them. It’s really hard to stay away from them. To boot, Pepperidge Farm® Puff Pastry Sheets are also vegan! Meaning no dairy! Woohoo!!! I have always been a fan of Pepperidge Farm® Turnovers, and I looked it up and they are dairy free too! Growing up my Mom used to bake them as a treat. Ohh, I just love them. 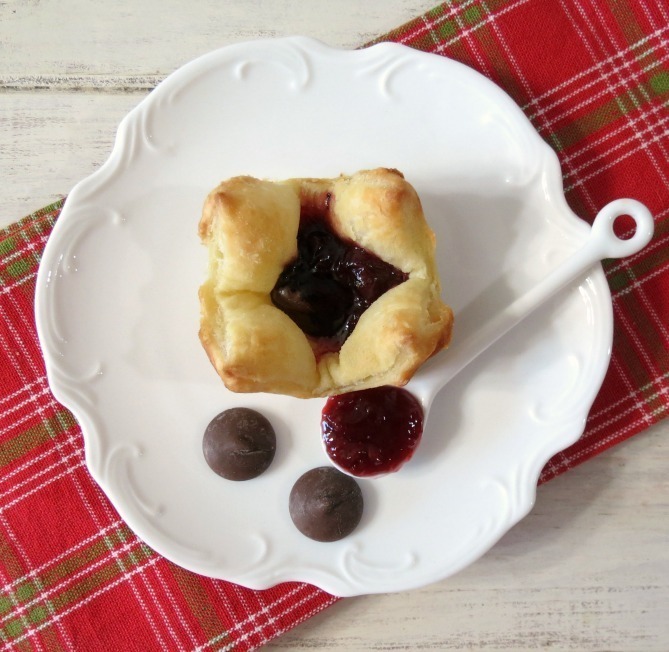 A light and flaky puff pastry filled with rich dark chocolate and topped with sweet cherry jam. On a lightly floured surface, unfold the pastry sheet Roll the pastry sheet to expand 1" on each side. Cut into 9 squares. Press the pastry squares into 9 (2½-inch) muffin-pan cups. Press down gently. In the center of each cup add 2 chocolate wafers, than top with 1 teaspoon of cherry jam. Let cool in pan for 10 minutes. Sprinkle with powdered sugar if desired. Serve warm. 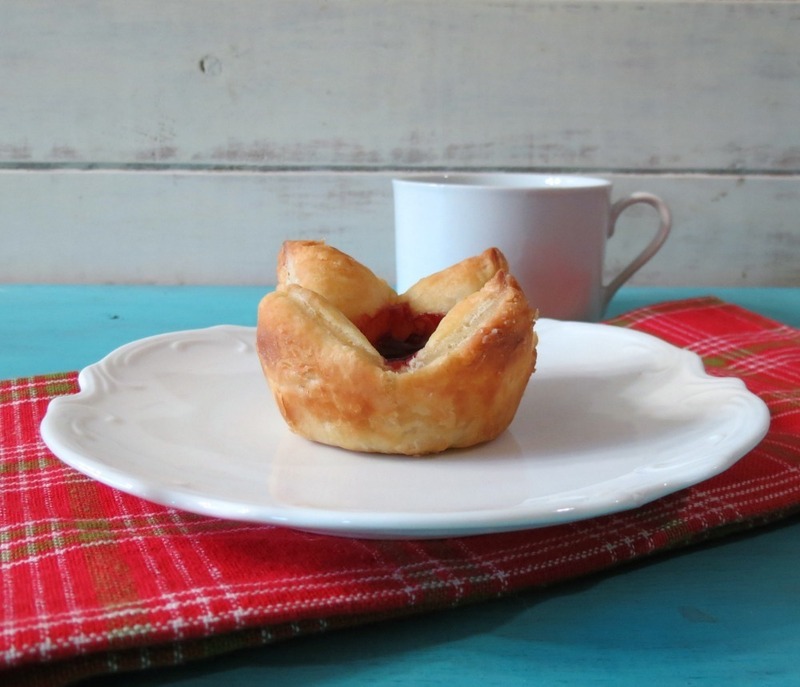 These little tartlets would be perfect for serving for breakfast or brunch during the holidays. If you’re not a fan of cherry jam, you could also use your favorite flavor jam, like strawberry, raspberry, orange or even blueberry. However, I am a huge flavor of cherry jam, it’s my favorite next to strawberry. 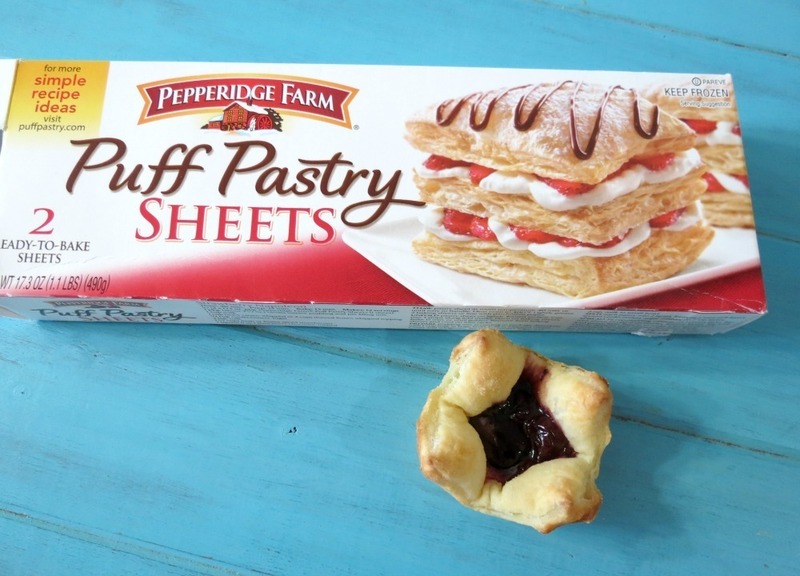 Next time you’re at the grocery store pick up a package of Pepperidge Farm® Puff Pastry Sheets and make one of your favorite treats. They are located in the freezer section. You can also check out Pepperidge Farm®​ on Facebook for more fun ideas, even share your own! What would you or do you make Puff Pastry? Well, I am going to have another little Chocolate Cherry Tartlet now. They are calling my name! Let Puff Pastry spark your imagination and you never know where it will take you – or rather, where you will take it. These look amazing! Pastry terrified me and I’ve had my first puff pastry debacle this year but for the holidays, I’m determined to master. You have to try again! It’s pretty easy and oh so tasty!! Yayyyy this is sooo easy Jennifer! LOVE it! Thanks Sophia! It was easy, which shocked me!! I am loving Puff Pastry!